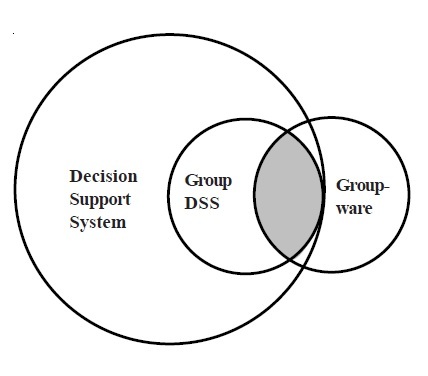 Having basic understanding of decision-making process and DSS, let us find out what is Group Decision Support Systems (GDSS). GDSS are interactive computer-based systems that facilitate decision-makers working together as a group to arrive at a solution for unstructured problem. The group of executives analyzes problem situations and performs group decision-making tasks. The GDSS provides mechanisms to help the users to coordinate and keep track of on-going projects, allow them to work together thru computer-supported communication, collaboration, and coordination. Typical applications of GDSS include email, awareness and notification systems, videoconferencing, chat systems, multi-player games, and negotiation systems. - Individual satisfaction increases with group size. The software developed for GDSS focuses principally on assisting brainstorming and mechanizing voting, two of the rare events in business meetings. We have reached the stage of mechanizing word-oriented problems in group meetings. Group support systems are designed to support group decision-making through specialized software, hardware and decision support tools. This can be defined as a combination of computer, communications and decision technologies working in tandem to provide support for problem identification, formulation and solution generation during group meetings. Broadly, the fundamental goal of GDSS is to support the exchange of ideas, opinions, and preferences within the group. The primary goal of GSS is to reduce process loss attributed to disorganization within the group, social issues such as member dominance, inhibition, peer pressure and other recognized difficulties of group interaction and to improve overall decision quality. GDSS are believed to improve the quality of group decisions by minimizing process losses and maximizing process gains. Process gains occur when certain aspects of the meeting improve the eventual outcome or result and process losses delay or reduce the final outcome. Thus, the overall meeting outcome is reliant upon the process gains versus the process losses. Let us now study some of the terms used in GDSS. Groupthink : Groupthink is a tendency of group members to fall into similar thought patterns and to disapprove the opinions that do not confirm to the patterns. This creates problems in group decision making process and sometimes become big hurdle in reaching to an appropriate decision. GDSS provides an opportunity to overcome the problems of groupthink where junior members of the group get equal chance to put forth their opinions that could not have been possible in face-to-face situations. Media Richness is defined as the potential information carrying capacity of data transmission medium. The information processing depends on the richness of the communication medium. Figure-1 describes the level of communication richness across various media. In GDSS, the richness of a medium depends on availability of number of communication channels and the feedback that is received by the decision makers. In face-to-face situation, the communication richness is very high as the feedback and inputs are received through words used, facial expression, body language and tone. An important aspect is also selection of communication medium as this varies from task to task. For example, a low medium richness is more effective in money transactions via an ATM whereas to understand loaning system of bank highly rich medium may be required. As can be seen, GDSS is a part of DSS whereas groupware may or may not be essential component of DSS though it has some properties similar to GDSS. War room, also known as electronic meeting room or electronic boardroom, is a facility created for GDSS by networking computers for each member participant. It is equipped with a large screen video display that can be seen by all the participants. There is a facilitator to control the display and have access to all members’ computers. The software used have the capabilities to plan a session and group members can propose agenda items through it. It can organize and structure members’ comments and can record them as organisational memory for longer and effective use.